We are a 501 (c) (3) agency that serves Area 2B, a Florida Department of Health designated eight-county area including Tallahassee, the capital of Florida. 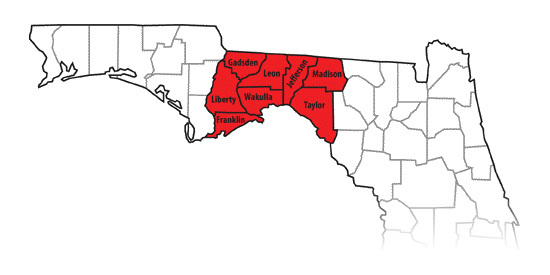 Area 2B is a portion of the “Big Bend” that stretches across Florida’s panhandle. Big Bend Cares is the only HIV/AIDS organization to provide case management services, and is the primary AIDS service organization providing HIV/AIDS education in this mainly rural region. Big Bend Cares exists to provide education and comprehensive support to people infected with or affected by HIV/AIDS. The origin of Big Bend Cares has its roots in the burgeoning HIV/AIDS crisis of the 1980s. At that time, the agency consisted of just a few volunteers and supporters who struggled to serve and comfort people suffering from AIDS at a time when treatments were largely ineffective and services were generally unavailable. Today, nearly 30 years later, Big Bend Cares is a 501(c)3 United Way agency, offering an array of “wrap-around” services. We provide not only case management services to protect and maintain the health of those affected by HIV/AIDS, but also attack the root causes of the disease through vigorous educational efforts and community outreach. Big Bend Cares is the only agency providing comprehensive HIV/AIDS services in the eight-county Big Bend region.